Sine Die: Don’t Mourn, Organize! MADSA comrades under the Gold Dome. Photo: Reid Freeman Jenkins. 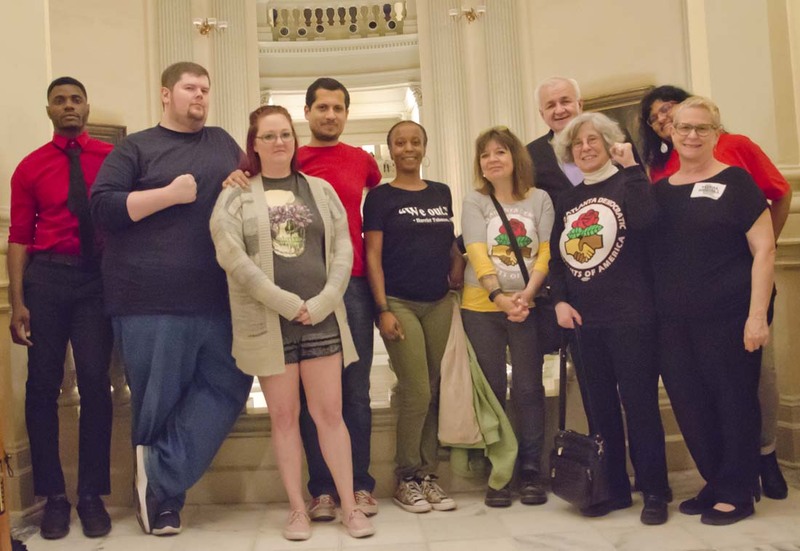 MADSA members joined progressive activists gathered at the Capitol for “Sine Die,” the last day of Georgia’s legislative session, to oppose a slew of right-wing bills that had made their way through the legislature. The most extreme attack passed this session was the viciously anti-woman House Bill 481. Drafted by reactionary ideologue Ed Setzler (House District 35), HB 481 effectively outlaws abortion in Georgia by prohibiting abortions after six weeks. Other bills, such as HB 316, attacked voting rights by mandating new machines that put Georgia’s elections further at risk. All in all, Georgia’s legislative session showed the need to build movements that can change Georgia’s political landscape so we can have a Sine Die that celebrates victories for the people, not fighting back against attacks.